However, while chestnuts definitely do make me think of Christmas, they also have a year-round association with a place that shaped my relationship with eating, that brings a thousand memories flooding to my mind, a place where food and life are inextricably entwined, and a place which has a very special hold on my heart. Italy. Growing up, I used to visit Italy with my family every year. My parents have a house on the border between Tuscany and Umbria, and in the summer holidays it became a second home from home. High in the hills above a luscious green valley, the solid stone farmhouse is surrounded by some of the great bounties of nature; rolling olive groves, fruit laden trees, a lawn where wild boar have been seen to graze and a dense, leafy sweet chestnut wood. With such incredible ingredients on your doorstop, it’s impossible not to eat well, and even the humblest of homes serve the most unforgettable food. Chestnuts are hugely important in Italian cooking. Before maize was introduced to Europe from the New World, Italians used chestnut flour to make polenta, a staple of their daily diet. It is said that an army marches on its stomach, and apparently Roman soldiers were given this porridge-like polenta made from sweet chestnuts before going into battle. Proof – if anyone needed it – of the nutritious properties of this humble nut. While delicious in savoury dishes – think wholesome breads, rich roasted game, velvety ragu – chestnuts also have an amazing affinity with all things sweet; figs and honey, chocolate and hazelnuts, soft brown sugar and rich folds of cream. 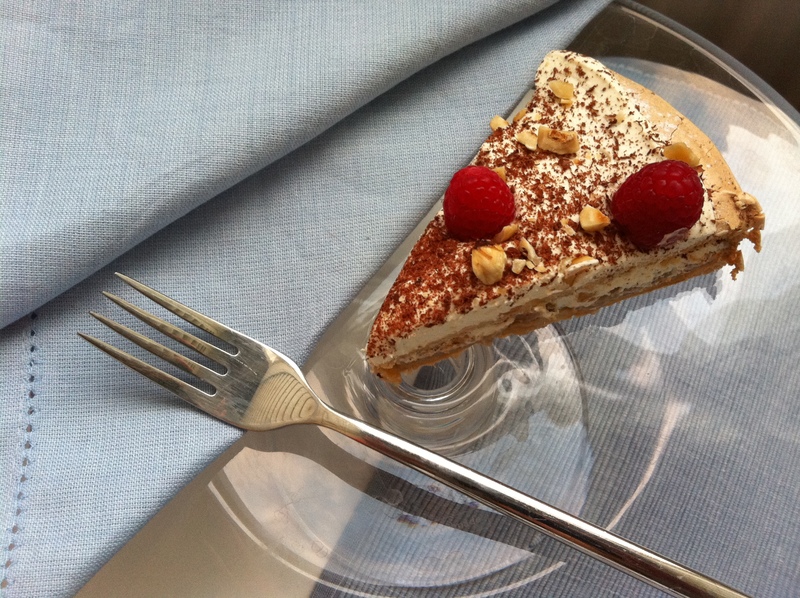 The following recipe is one such sweet, inspired by Italy, but more directly by my Dad. After making an egg-yolk rich vin santo ice cream for a party last weekend, I had a huge quantity of leftover egg white. We were visiting my parents for lunch the next day, and – as usual – I’d promised to make a pudding. My (rather larger) fatherly loaf is a huge fan of chestnuts, and had been in raptures over my recent Chocolate Chestnut Truffle Cake post, without ever actually getting to try a slice. I knew he was hoping for something chestnut-based, so decided to come up with something that combined their nutty richness with the copious amounts of egg white in my fridge. The result is a chewy, creamy chestnut meringue cake with more than a nod to the French Mont Blanc, a pillowy dessert of chestnuts topped with whipped cream and named after the mountain of the same name for its visual similarity. The meringue adds a lovely crispy chewiness, and layers of chocolate shavings and crunchy roasted hazelnuts mean each mouthful provides a wonderful contrast of texture and flavour. Meringue isn’t the first thing I’d associate with this time of year – it always makes me think of summery fruit-filled pavlovas – but combined with these strong, wintry flavours makes for the most indulgent dessert. Do chestnuts make you think of Christmas? Will you be roasting any on an open fire? And what foods do you associate with this time of year? Preheat the oven to 180°C. Line two baking sheets with baking parchment and, using a cake tin as a guide (20 or 23 cm would be fine), draw a circle on each. Whisk the egg whites and salt until soft peaks form. Add the sugar and continue to whisk on high speed for about 5 minutes until the meringue is smooth and glossy. Spoon the mixture evenly between the two trays, using the circles you have drawn as a guideline. Bake for approximately one hour, then turn the oven off and leave the meringue to cool inside. Meanwhile, put the chestnuts, milk, sugar, vanilla pod and seeds in a small pan and bring to the boil. Remove from the heat and leave to infuse for around 10 minutes, then remove the vanilla pod and drain the chestnuts, reserving the liquid. Purée the chestnuts in a blender, adding small amounts of the leftover milk mixture at a time to achieve a consistency similar to whipped cream – a soft, smooth texture that can be dolloped. Whip the double cream to soft peaks. When ready to assemble, place one meringue layer on a large plate. 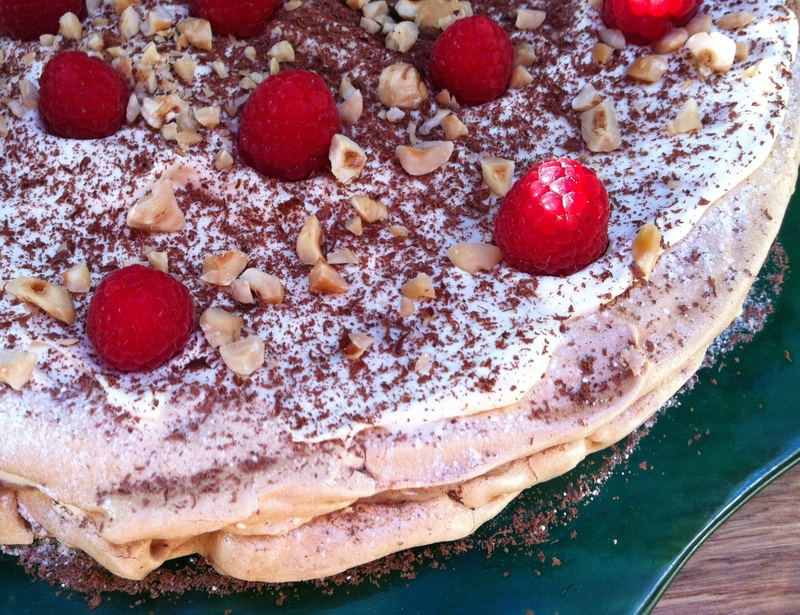 Spread over half the chestnut purée, half the whipped cream, and scatter with half the grated chocolate and hazelnuts. Place the second meringue on top and repeat the process, dotting a few raspberries over the top to finish. 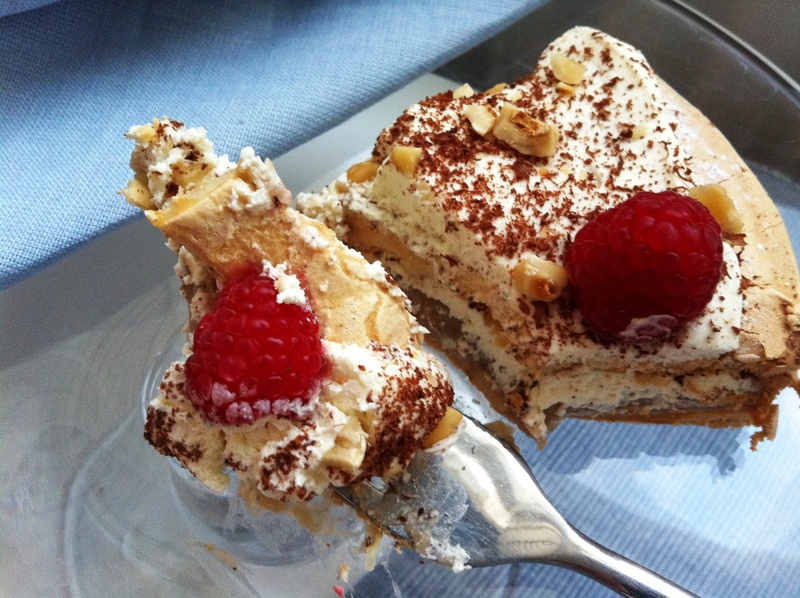 Serve in thick, creamy, chewy slices with an extra grating of chocolate, if you like. The perfect winter pud. Nothing says a northern hemisphere Christmas to me like the smell of roasting chestnuts. I’m scoffing as many as I can before we fly south on Sunday. Nb, this looks just sublime. How can I not love it, Chestnuts rule! Splendid and so tempting! That is one irresistible cake. What a pretty cake that is! I have been recently gifted some chestnuts and really have no idea what I’m going to do with them. Will have to keep this one in mind. Oh, I must now try chestnut porridge, what a wonderful idea. Very envious of your Italian holidays. I’ve never been to Italy, but have dreamt of going there for many a long year. Given that we have family and friends there, I’m not sure why we haven’t yet made it, but one day I will see those olive groves with my own eyes. This is my dream dessert…I think I know what to make for Christmas Day dessert now. Glad I’m getting the chance to make meringue this weekend as a practice! Tori – thank you. Have a wonderful Christmas – very jealous of the southern hemisphere sunshine you’ll be getting! 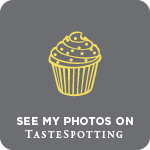 Regula – here’s to chestnuts! Choclette – thank you. And I can’t believe you’ve never been to Italy. You HAVE to go. It’s one of my favourite places in the whole world. 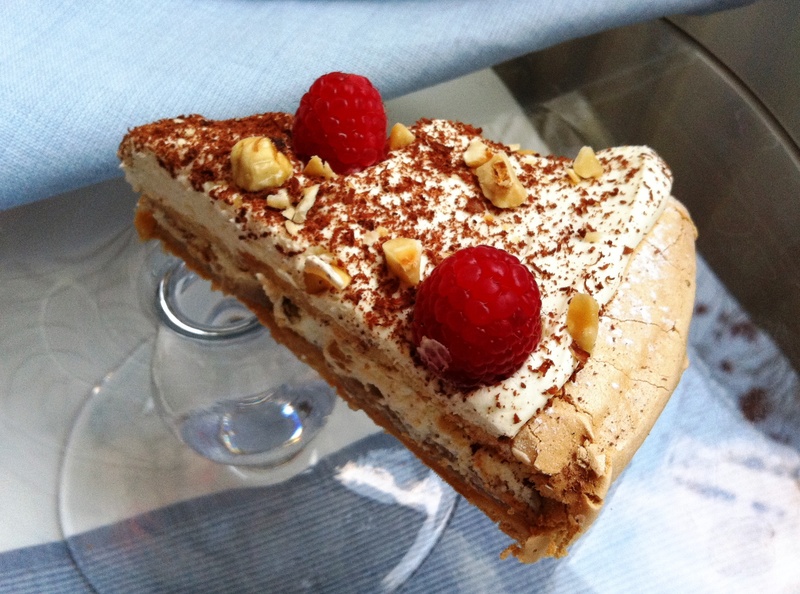 Miss South – this would be a lovely alternative to Christmas pudding. I’m still undecided what to make for my family…so much to choose from! Shu Han – make it! It’s so simple and delicious, and a nice break from savoury chestnut dishes. Oh my! This is fantastic! Love the texture of your cake. Bookmarking this .. definitely making it soon. I have no idea where I would even buy chestnuts. *stumped. Or what they taste like. The cake looks great, though. Lovely post. This cake reminds me of cakes my mother used to make as a child — she is Polish and chestnuts feature a lot in Polish baking. I can exactly picture how this cake tastes, smells, and feels in the mouth. A house between Tuscany and Umbria? You lucky thing, you! Believe it or not, I have never had a chestnut. They grow in my grandparent’s front yard, though. I should pick some up this week and see how they are! Thanks for the inspiration – these sound lovely! I usually associate sugar cookies and gingerbread with Christmas. And ham. And my Grandma’s ambrosia and watergate salad. Soooooooo duhlishous! This chesnut meringue cake looks wonderful and something i would like to try as I love sweet chesnut paste in cakes. I am drooling over the pictures of the cake. 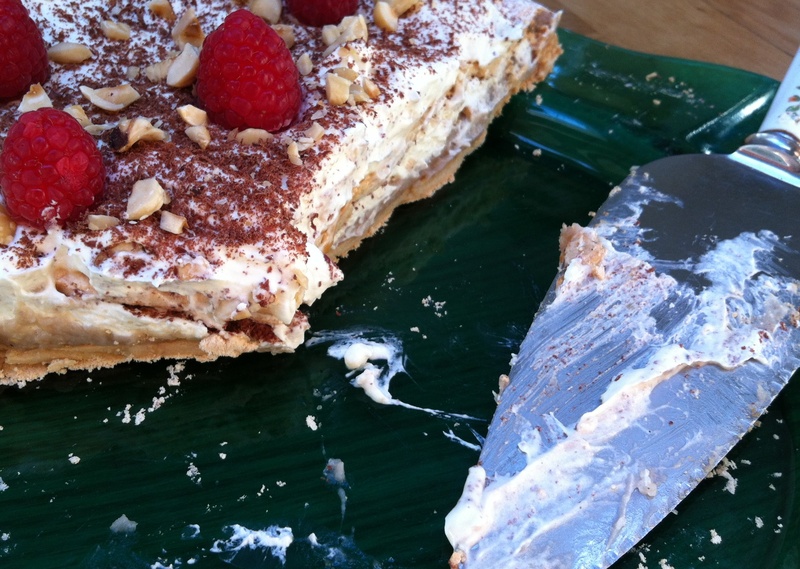 To think of all those meringue layers and chestnutty cream…!!! Lovely. Baker Street – thank you, enjoy! Lucas – you can get chestnuts in pretty much any supermarket…where do you live? Kaitlin – I know, I do feel so lucky. And definitely do try chestnuts, they’re great. Gingerbread definitely makes me think of Christmas too! Mandy – thank you, do try it! Laura – I love that if I make ice cream I basically have to make macarons or meringue to use up the egg white…the perfect excuse for more baking! luv it! what a great recipe!